Congress decided this weekend it’s ok to keep American school-children addicted to high-salt foods. Lobbying by the food industry and school boards succeeded in getting a provision put in a final federal budget bill that will prevent the government from requiring less salt in school lunch menu items. Congress wants to keep American School children addicted to salt. Shame, shame, shame on them. This is obviously a major loss for America’s health. As someone who suffered from the ill-effects of too much salt in my diet for years and now struggles to find any prepared foods with low levels of salt, I am deeply saddened, although really not surprised, by this decision. 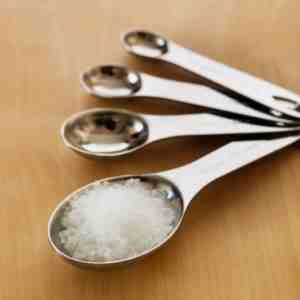 Salt is an easy add to foods to cover up a lack of good ingredients or a lack of real taste. It’s also a preservative that fits into our culture of creating prepared foods that have long shelf lives and low spoilage levels to maximize food company profits. With this president a lame duck, I doubt his administration (read his wife Michelle) will have much luck in getting more salt out of American diets in the next two years. If a Republican wins the next presidential election, expect even less progress on the salt front. So the government may not be providing us much help in getting salt from our diets, but you can always turn to this blog, our recipes and our ingredients list for help. We are committed to a low salt diet, which means less than 1,500 mgs a day. What happened to my elk burger, Happy Gnome?